Up at 4, and in the car at 4:30 with a packed breakfast from our hotel, we head to the airport were our little propeller plane takes off for Villavicienco at 6:30. 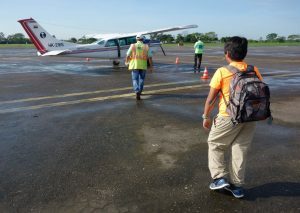 We land in this city that seats just between the high Andeas and the enormous expense of flat lands called the Llanos. As we disembark, a vintage DC-3 is about to take off. We are whisked by a lady to a garage outside the airport were all our bags and ourselves are weighted to make sure we are not too heavy to fit in the 5 seat Cesna that will fly us to la Macarena. We are super excited since the last time we flew one of those was in Botswana, over the Okavongo Delta. We share our flight with a young Colombian woman who lives in Chicaco and her father from Bogota, whom whe takes every year for a big trip in the country. 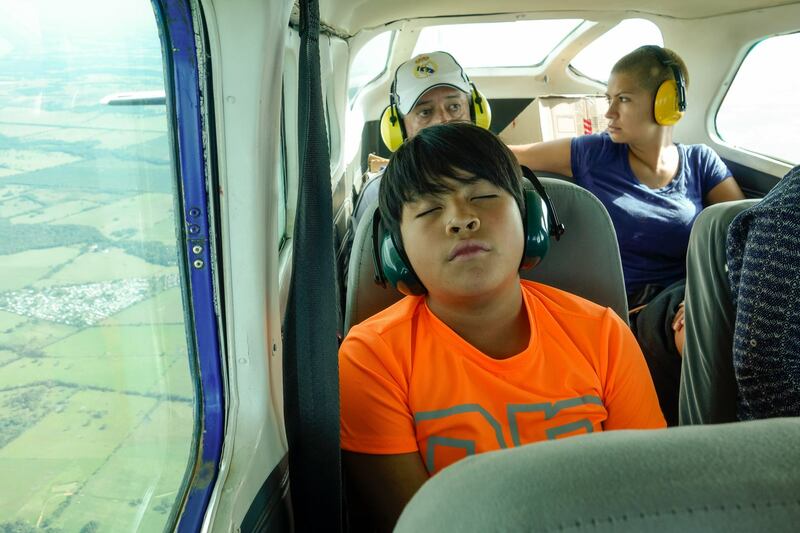 Ryo is completely exhausted and only witnesses the take off before falling into sleep. 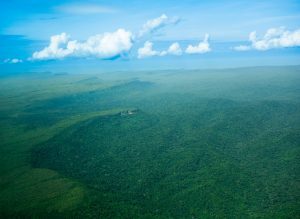 Near Villavicienco, there are extensive crops of palm trees, but the further we get, the more ground is still lush forest, with some red dirt tracks crisscrossing the green expanse, and visible traces of ongoing deforestation. From the Cesna, we can even make out llaneros on their horses. 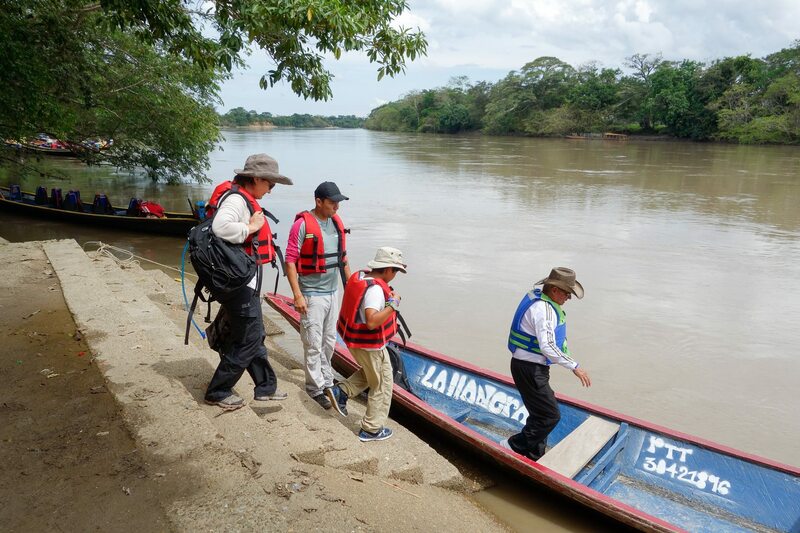 Several large rivers run down from the Andes, their muddy waters gleaming in the morning sun. 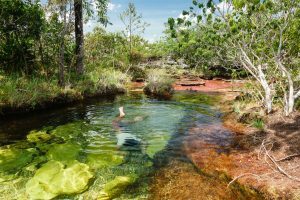 And finally we fly over Caño Cristales, the little river that we are here to discover, for it has a very special endemic plant growing in its water that gives the river a red color from June to December. 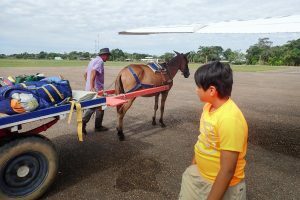 We land in tiny winy Macaraena Airport were a cart driven by a horse meets our plane to collect our suitcases! Our guide drives us at the other end of the main square (we could have walked really!). Our hotel is pleasant with a nice tropical garden, and our room is big and clean. We have 20 minutes to get ready for our outing to the river. Plastic bottles are prohibited in the park, so we bring Nalgene bottles to the bar next to our hotel so they can be filled up with bottled water. We are given a packed lunch, and off we go to the dock. We board a Indian style long flat boat with our companions from the plane, and several turtles, a stunning Hoatzin bird and an emerald green iguana further we disembark at a finca. They hatch turtle in a pond to help protect them and also grow coca! After a short climb, we are out of the jungle on a rocky plateau, and walk a trail meandering amongst yucca plants and scattered coconut trees. It’s really hot and humid and we are drenched: as we aren’t allowed to use insect repellant and sunscreen, we have long pants and long sleeves. 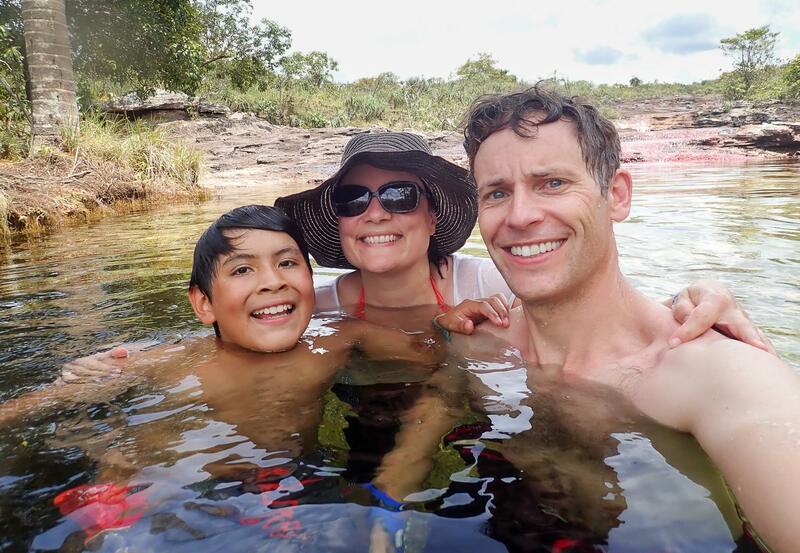 We reach a lovely grove with a natural pool in the cascading river and it’s just beautiful! 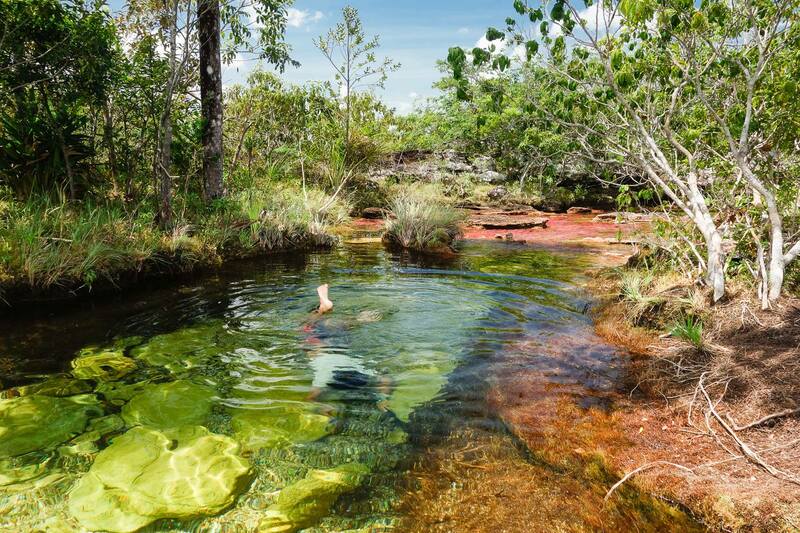 The stream is very pretty and it’s made more dramatic thank to the Macarena Clavicae, a water plant that takes extraordinary colours of red, pink or green. And what a bliss to sink our overheated bodies in the warm and crystal clear water! After this first break, we go further up along the little river for a second break at a little cascade with lots of pool holes and enjoy our lunch of tamales. 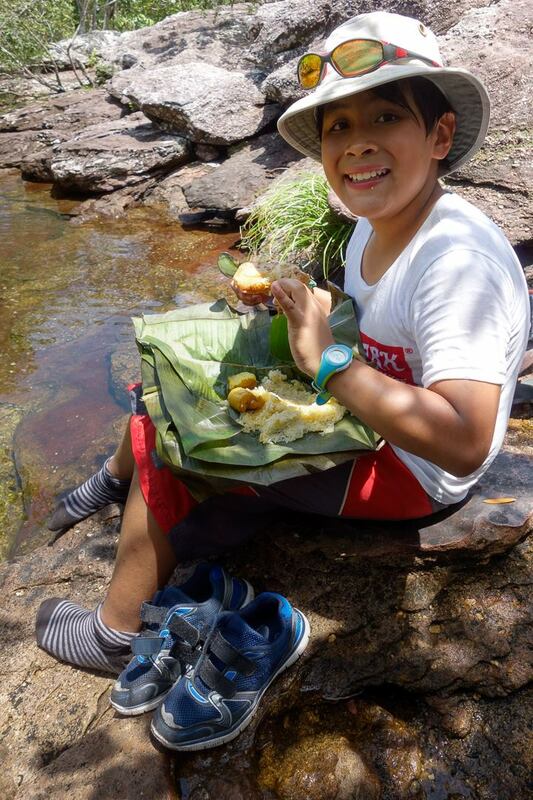 The banana leaves parcels work very well for an ecological pic-nic! After having soaked abundantly in the various pools and getting massages under the cascade, we retrace our steps back to the boat and the village were we take a very needed nap. 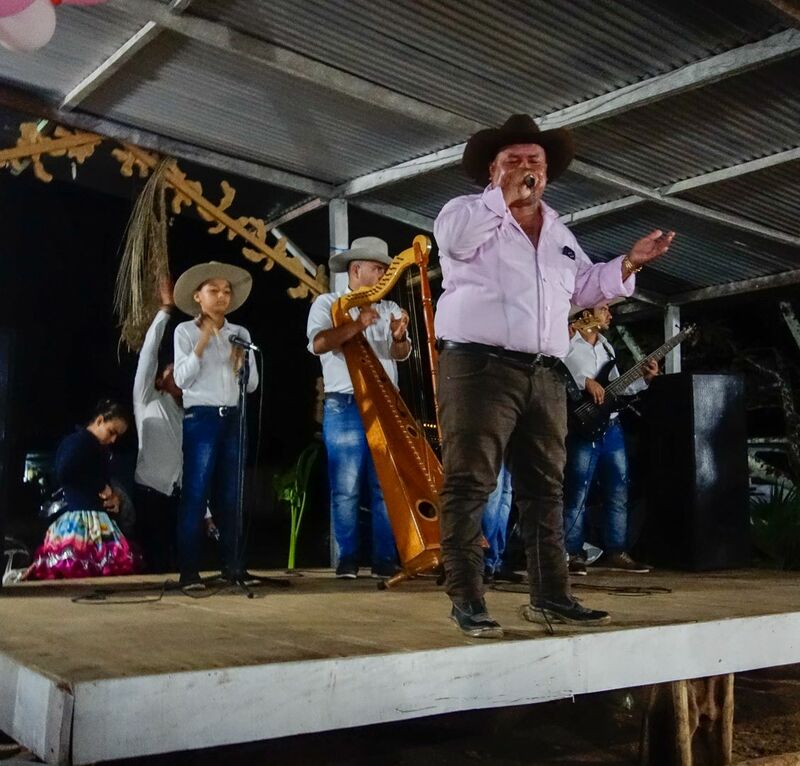 Once a week, the villagers organize a show were they play Llaneros typical music, sing, tell the story of their village and dance. All the tourists are gathered, probably 150 people, and we are served dinner by our guides while watching the show. 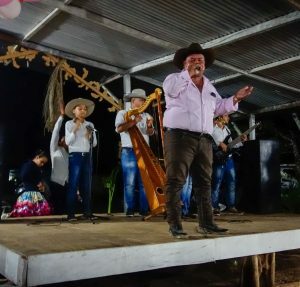 It’s really moving because the mayor of la Macarena explains with justified pride how they have developed this tourist activity as a community. It only started in 2008, before the place was very dangerous and ridden by guerrilla. The people are so happy to be in peace again. The show is lovely, albeit a bit long after waking up at 4 this morning. Everyone is really putting their heart into it, and the 5 year old kids dance is a hit as well as the finale with the harp player, who is impressive of dexterity.